Plant a tree in memory of Robert "Buddy"
Be the first to share your favorite memory, photo or story of Robert "Buddy". This memorial page is dedicated for family, friends and future generations to celebrate the life of their loved one. 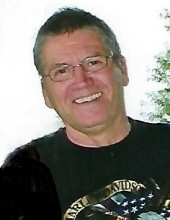 Mr. Robert Delmont "Buddy" Matney of Greensburg, Kentucky, son of the late Robert Matney and Iva Martin Meyers and his step-father: Carl Ray Meyers, was born on Wednesday, July 9, 1952 in Maylene, Shelby County, Alabama and departed this life on Friday, April 5, 2019 at his home in Green County. He was 66 years, 8 months, and 27 days of age. He had made a profession of faith in Christ and attended the Horse Cave Church of Christ. He was also a retired brick layer and a member of the Local 21 Brick Layers of Chicago, Illinois. Survived by his wife of 42 years, Mary Frances Knight Matney of Greensburg, having united in marriage on October 19, 1976. Other survivors include two daughters and sons-in-law: Shellie and Patrick Vicari, and Heather and Nicholas Kelding all of Indiana; a son and daughter-in-law: Brandon and Tanya Ivie of Indiana; three sisters: Dinah Matney, Marianne Newsome, and Lori Trahan all of Alabama; a step-brother and step-sister: Carl Meyers and Sherry Borkowski both of Indiana; brothers-in-law and sisters-in-law: Lee Hayes, Terry Rayburn, Larry and Shirley Giambrone all of Alabama, and Phillip and Bernice Rayburn of Arkansas; 17 grandchildren; four great-grandchildren; and a host of other relatives and friends. The funeral services for Mr. Robert Delmont "Buddy" Matney will be conducted at 10:00 A.M., Central Time, Wednesday, April 10, 2019 at the Cowherd and Parrott Funeral Home with burial to follow in the Greasy Creek Cemetery. Bro. Bill White officiating. Memorials are suggested to the St. Jude Children's Research Hospital, which can be made at the funeral home. To plant a tree in memory of Robert "Buddy" Delmont Matney, please visit our Tribute Store. "Email Address" would like to share the life celebration of Robert "Buddy" Delmont Matney. Click on the "link" to go to share a favorite memory or leave a condolence message for the family.